Parts of the GRVD are bastions for certain cuisines. 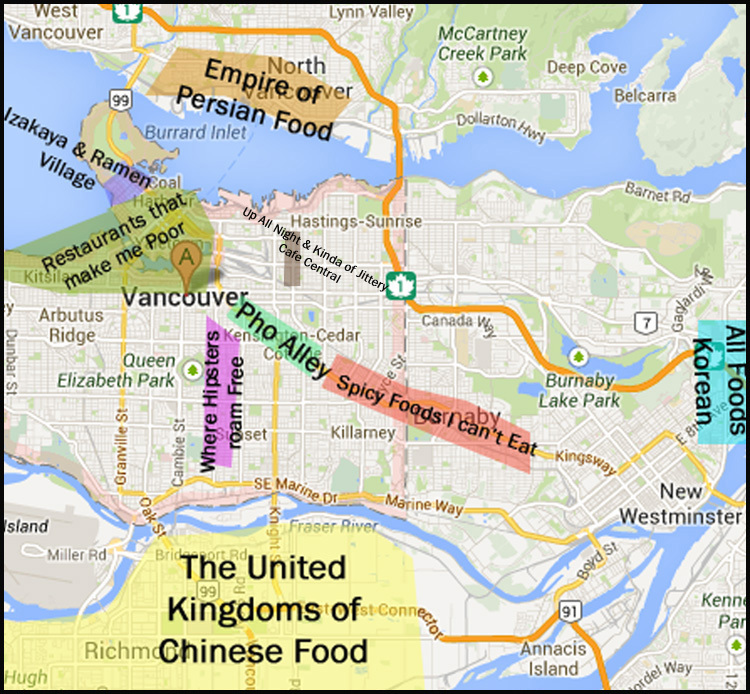 In my head, this is how I view the region with my food filter. The map might not be as exact as it can be, but I think you get my point. Nestled in the North Shore is the Empire of Persian Food. I often don’t venture out that way. As I result I feel like I’m missing out on a wonderful culture and some delicious food. When Cazba, a stalwart of the Persian food scene in North Vancouver, opened up a food cart a year ago, I got a glimpse of what I was missing. I was determined to fit in a dinner drive over one of the Narrow bridges, when Cazba opened an outpost in the heart of the Davie Village a few months ago. Upon reviewing their menu before my first dinner there, I spotted something that warmed my heart. Whenever I look at menus featuring cuisines I’m not familiar with, I often spot similarities more than differences. It seems that regardless of culture, the concept of crispy rice with stuff in it oron it is beloved around the world. There are Rice Crispies from the USA, Wor Bah from China, Dolsot Bibimbap from Korea, Arancini Di Riso from Italy and you can add Tahdeeg from Iran to the list. How different can we all be if we have the same heart that loves crispy rice with stuff in/on it? My friend and I waited in a sleek modern dinning room for our Tahdeeg to arrive. The Tahdeeg was served with of few spoons full of your choice of either Gormeh Sabzi or Gheymeh stew. I noticed a slight sheen on the large pieces of crispy rice. I suspect the rice was crisped on a griddle and not formed naturally from the rice drying out on the bottom of a rice pot. The Tahdeeg was inconsistent in its texture, some pieces were perfectly crispy and pleasant to chew; while other pieces were too hard and difficult to breakdown even with the stew softening it. I selected the Gormeh Sabzi stew which is a mixture of herbs, kidney beans and beef. The herbs gave the stew a brightness. 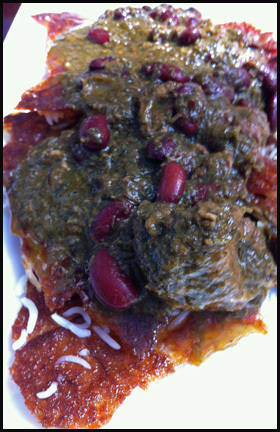 Overall it was savoury, not heavy but filling with the tender beef and kidney beans. I enjoyed the Gormeh Sabzi and would return to eat this dish on its own. 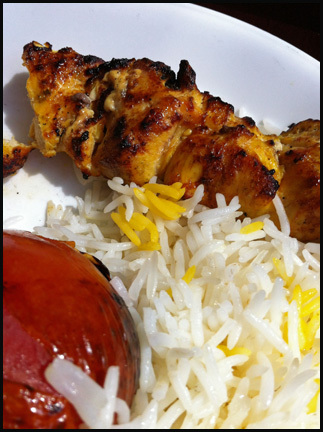 For my entrée I got the Joojeh (chicken) kebab with a grilled tomato, saffron rice and salad. I picked the chicken kebab because I wanted to see if there was difference in execution between their restaurant and food cart. The Joojeh was well seasoned, moist and tender. It was slightly juicier than the food cart version. The chicken was the star of the dish as the other components were just ho-hum and nothing to write home about. The saffron rice was mostly plain long grain rice with grains of saffron infused rice on top. The tomato was nicely grilled. The salad was fresh and simple comprised of ice berg lettuce, tomatoes and cucumbers with a creamy dressing. I liked my first meal enough to returned for a second. 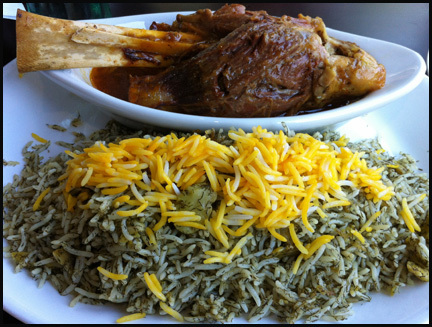 This time I ordered the Baghali Polo (slow cooked lamb shank). The meat fell of the bone and was seasoned well. The lamb shank sat in a pool of its own juices which had an intense unami flavour. 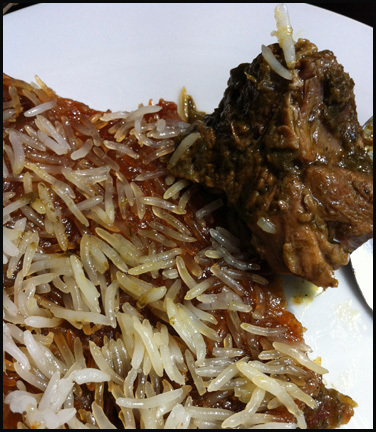 Instead of plain rice, the lamb was served with basmati rice cooked with dill and fava beans. It was aromatic with a scent of dill. I thoroughly enjoyed the rice as it had an earthier feel and complex flavor due to the inclusion of the beans and dill. It mopped up the juices from the lamb shank perfectly as well. Each component of the Baghali Polo brought something to the dish and as a result I enjoyed this entrée more than the Joojeh platter I had on the previous visit. On a side note, I did feel a bit thirsty after both my meals at Cazba. However I do try to eat a healthy low sodium diet when I don’t dine out and my dining companions didn’t feel thirsty after their meal, so it could be just me. I was happy I didn’t have to trek out the North Vancouver to try Cazba’s food. I definitely was missing out; Persian cuisine is tasty. This is a great addition to the Davie Village area, so if you’re heading to the fireworks or in the area for Pride festivities this weekend, check it out. Wishing everyone a Happy BC Day and Happy Pride Long Weekend!